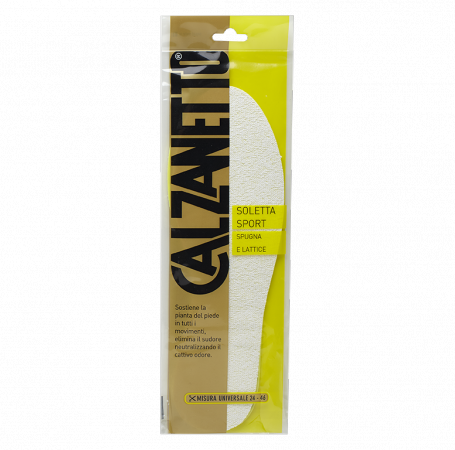 Insole that absorbs humidity with great effectiveness and eliminates sweat and unpleasant odours. Universal size from 24 to 46. Cut out the insoles to the desired size by following the printed broken line. Then place them inside the shoe in such a way that the sponge side is in contact with the foot. In all shoe types, but ideal for sports shoes. The latex supports the sole of the foot anatomically in every movement and, along with the cotton sponge absorbs and eliminates sweat and neutralizes unpleasant odours.